At Computex in 2016, Cryorig, better known for its cooling and peripherals, unveiled a PC monitor stand that doubles as an ITX case, dubbed the Taku. Fast forward to November of 2017, well after its initial projected availability, and the case is finally being released. The Taku has been under development for over two years in-house plus a year of co-development with manufacturing partner Lian-Li. 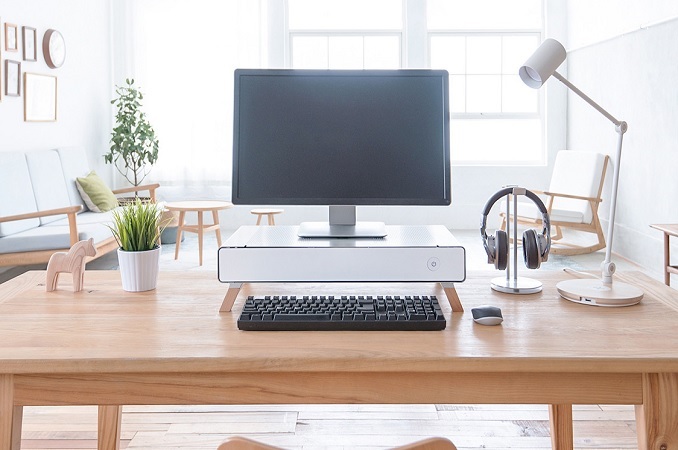 The unit itself is a hybrid PC Monitor stand and an ITX form factor PC case. It is designed so that a monitor sits on top, a complete ITX size PC (including a full-size video card) is inside the case, and full-size keyboard hides underneath the solid wood supported chassis. The chassis only comes in silver and is made out of anodized sandblasted aluminum with the legs handcrafted from solid wood. The front panel is very clean with only a large power button on the right side. The top and bottom have ventilation holes cut out for cooling the components inside with the top vents closer to the edges of the case allowing the monitor, up to 15kg/33lbs, to fit in the middle and heat to escape through the top. The sides are also vented. The right side of the case users will find two USB 3.0 (5 Gbps) ports along with microphone and headphone jacks. One of the unique features the case has is an internal system tray which slides out via a push opener and locks into place when pushed in. It can also be detached from the chassis by pushing down on the two safety buttons on the rail (appears to be similar to racked servers in that respect). Internally, there is support for a Mini-ITX sized motherboard and SFX or SFX-L power supplies. Graphics card support is up to 280mm in length, 40mm tall (dual slot), and 134mm wide (from PCIe slot to top) so many full-size video cards are able to fit in the small case. That said, once it gets past around 140mm it appears the 2.5” drive cage needs be removed to allow for longer GPUs or use a single slot GPU if the 2.5” storage is needed. CPU cooler compatibility is up to 48mm while the maximum height for memory is up to 52mm of which most DRAM modules will not have an issue with. Storage wise, the Taku has space for two 2.5” HDD/SSD and one 3.5” HDD/SSD. The case includes a single 92mm fan for air circulation. Cable management was also a consideration as Cryorig have cable routing ports on the top front portion, one on each side. Their location allows for running cables from the back to the front while keeping the cables hidden. Pricing for the Taku is $299 and will be released first in select markets including USA, Japan, and Taiwan starting in December. Other markets are planned for release in the first half of 2018. If you happen to be one of the 138 Kickstarter backers, there is an option to pre-order and will be guaranteed shipping beginning December 1st and no later than December 31st.